Ultimately, we have to find the redeeming, and thus transforming, understanding of our psychologically troubled human condition. And it is precisely that dreamed-of insight, and its now desperately needed transformation of our lives, that Australian biologist Jeremy Griffith presents in this book. 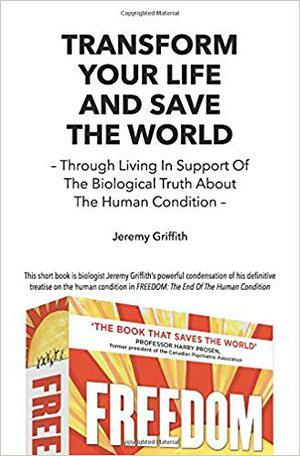 Titled Transform Your Life And Save The World - Through Living In Support Of The Biological Truth About The Human Condition, this book is a very short but powerful condensation of Griffith's definitive treatise of the human condition that is presented in his book FREEDOM: The End Of The Human Condition. The genesis of Transform Your Life And Save The World lay in Griffith's address at the June 2016 launch of FREEDOM at the Royal Geographical Society in London. Commencing with very brief extracts from Tim Macartney-Snape's Introduction at the launch, and Sir Bob Geldof's keynote address, it goes on to summarize FREEDOM's content in 3 powerful chapters: 'The Dishonest Biology', 'The Truthful Biology', and 'The Resulting Transformation Of The Human Race'. In fact, in just 68 pages of sensational world-shaking but at the same time spectacular world-saving TRUTH about human behavior, Griffith delivers a presentation that is so profoundly liberating, relieving and transforming of your life that this little book may be all you need to read! As Professor Harry Prosen, a former President of the Canadian Psychiatric Association, has said, "I have no doubt this biological explanation of the human condition is the holy grail of insight we have sought for the psychological rehabilitation of the human race."